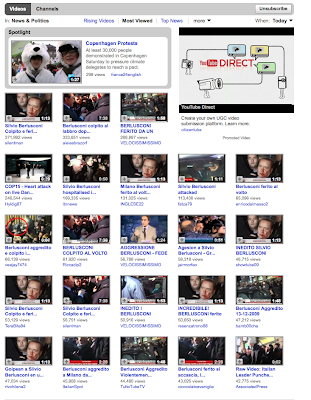 All but four of the 50 "Most Viewed" videos in the News & Politics category on YouTube today featured Italian Prime Minister Silvio Berlusconi, who was attacked at a political rally in Milan over the weekend. A man in the crowd allegedly punched Berlusconi in the face while holding a small statue, leaving his face badly wounded. We saw a similar pattern last year when an Iraqi threw a shoe at President Bush and footage of the incident dominated the Most Viewed rankings in News & Politics for days. This footage from ITN News (with almost 170,000 views at the time of this post) shows the Prime Minister's face bloodied and beaten and looking quite dazed.